What is the Angle Bisector Theorem? Take the example of a Triangle and divide the triangle into an equal smaller triangle. A line that is used to cut the angle in half is named as the angle bisector. When this concept is used with triangles then it divides the triangle in the most unique way. Here, is the complete detail of angle bisector theorem and how it works. 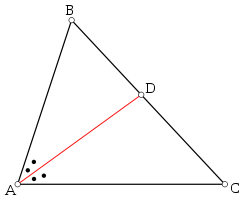 On the basis of the angle bisector theorem, you could divide the sides of a triangle proportionally. Every time for the angle bisector theorem, you have two small triangles too and they are proportional to each other. The theorem could also be explained in terms of ratios as well. This ratio further helps in solving tough mathematics problem too. It may be tough for students to understand this theorem at the first attempt. With a deep understanding, it can be quickly applied to real-world problems. So, how will you check either a line segment is angle bisector or not. To check the same, we should use numbers that are assigned to sides to check either side are working in a perfect ratio or nor. If ratios are perfectly equal to each other, the line segment is the angle bisector. The theorem was proposed by Robert Simson and he proved the theorem in a perfect defined way. An angle bisector of a triangle divides the opposite side into two segments that are proportional to the other two sides of the triangle. When the angle of a triangle is bisected either internally or externally with a straight line that cuts the opposite side in the same ratio at any particular angular point. It would be interesting knowing how you can use the angle bisector theorem in the real-life. They are used by architects when constructing or designing buildings. Most of the times, machines are constructed through machines and the process is automated through computers. However, the developers working on computers should know how to bisect the angles. Use law of sines on triangles ABD and ACD in the above figure. ∠ DAC and ∠ BAD are equal. Hence, the RHS of the equations 1 and 2 are equal, therefore LHS must also be equal. Another best example of angle bisector is the practice of quilting that involves bisecting angles if you would look at the triangles carefully. One more example of the angle bisector theorem that I have experienced personally is sewing the striped material and cutting it properly based on a regular pattern. The process involves diagonal cutting of the fabric. You could check a plenty of example for the same over the wen where intelligent patterns are combined together in lack of sufficient fabric. Instead of following the bias cut, the vertical or horizontal techniques are utilized here. When designing a skirt, sometimes the components are triangular shaped without any peak of the triangle. To design the outfit, you need to bisect the component and make each component from a different fabric when you are working with small fabric and each of them is not particularly suitable for the original components. Here, you could give a different orientation to the fabric. For example, when you are working with stripes, the lines of one can be positive inverse and line of other would be the negative inverse that is named as the perpendicular too.